Happy Friday friends! Did you guys all see the kitchen challenge announcement, a few Fridays ago? Elah Tree and I are just so incredibly excited for this little thing! We're both really hoping it becomes a fun way for us all to break out of our cooking comfort zones and experiment these next few months! Don't forget, April's ingredient is LIMES. Can't wait to start cooking (or baking) with those babies! Now for this little beauty! skjfnvkrnvrgbeirugni you guys! Eeeeeep! 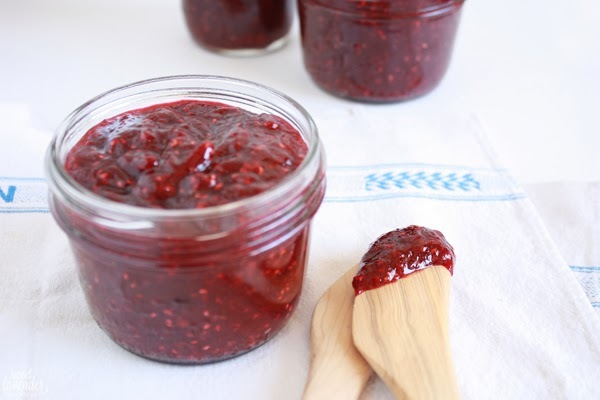 So excited to share with you all this EASY jam recipe! I kind of have a thing for really good jam. Whenever I enter a gourmet cooking store, I usually end up over in the jams/jellies section (as well as the olive oils and mustard section) hoping to spot some new concoction of flavors I just have to try. There are some pretty creative combos out there! I love the sweet, spicy and/or salty types! Like a good chutney! MMMmmm! Does chutney even count as a type of jam? Also, how many of you just thought of Schmidt from New Girl saying "Hair Chut-en-ney"?? Let's say everyone. Anywho, I could very easily have half a shelf in my fridge filled with opened jams, jellies, and chut-en-neys! What a dream fridge! Then sitting in front of that mess is the saving grace, in jam form- two little lovely jars of scarlet red amazingness bliss- my Brown Sugar Raspberry Jam. Definitely NOT a fail. And definitely a recipe worth sharing. This recipe is super easy to make and can be done using a candy thermometer OR the plate test. I usually use the plate test for all my jams, as it has never failed me yet! What is the plate test, you ask? This! 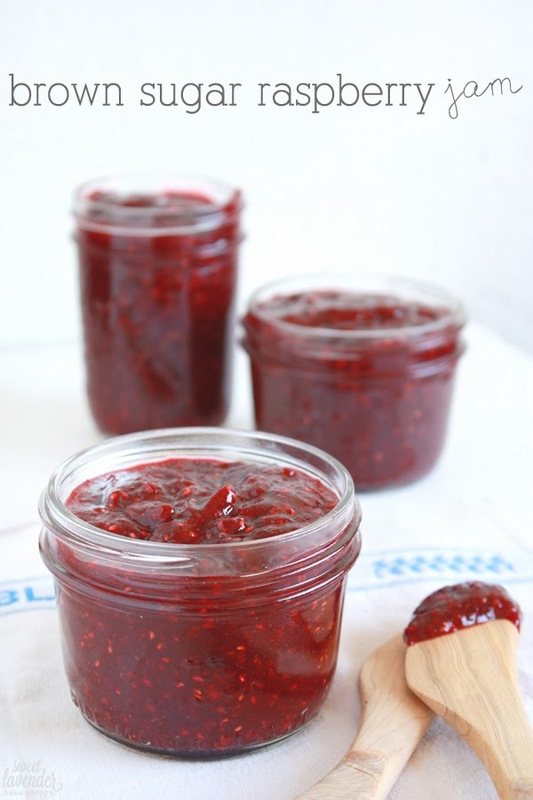 I also always add some sort of naturally filled pectin fruit to my jam to help firm it up. I'm not a fan of using pectin in any other form (like that powdered stuff). Again, just me. That's why you'll see the tiny bit of apple chunks and skins in this recipe. Apples are filled with natural pectin! 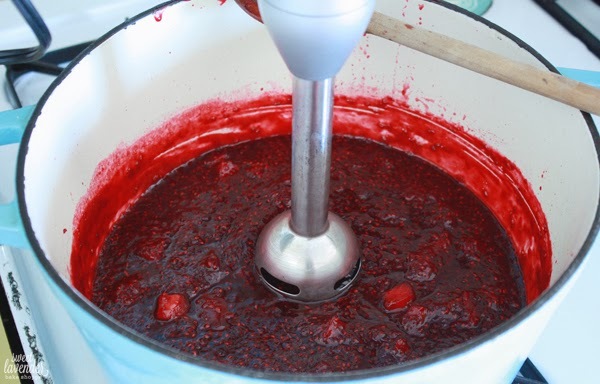 When heated with sugar, it creates a natural thickener for jams and jellies! The brown sugar is a nice change up to the usual granulated sugar used because its deeper flavor helps soften and accompany the raspberries' nice, bright, and tart flavors. 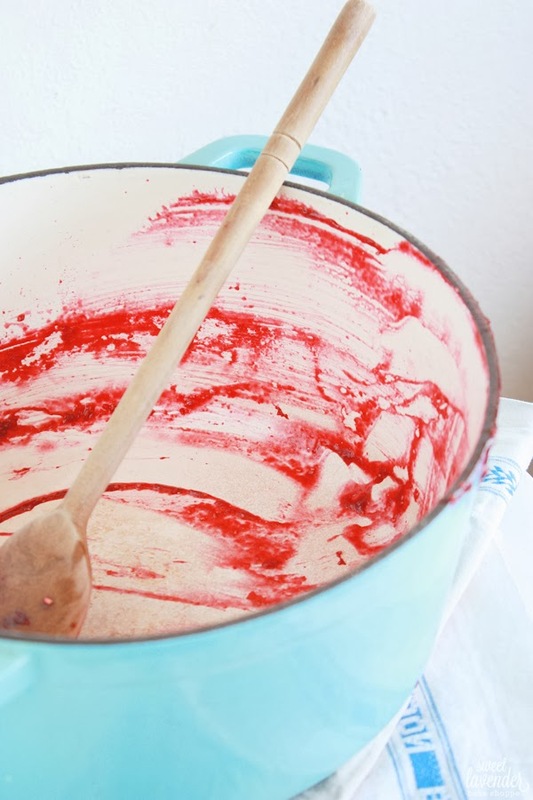 Brown sugar and raspberries just might be a match made in jam heaven. 2 (12oz) bags organic frozen raspberries- no sugar added! Just fruit. Check your label! 2. 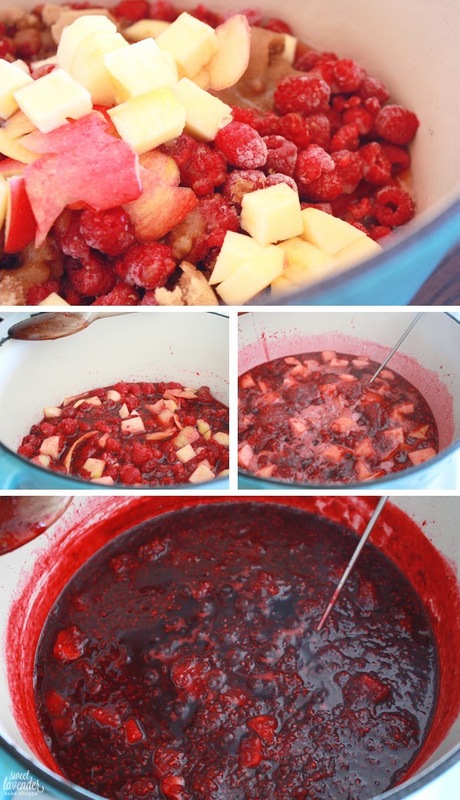 In a large non-reactive sauce pot (I like to use my dutch oven), add your frozen raspberries, brown sugar, water, apple skin, apple chunks, lemon juice, and sea salt. Mix well with a wooden spoon. 3. Bring mixture to a gentle boil over medium-high heat. Once boiling, turn heat down until you have a gentle steady simmer. Insert your candy thermometer, if using. Allow mixture to cook, about 38 minutes or until candy thermometer reaches 220°F, stirring every five minutes with wooden spoon. 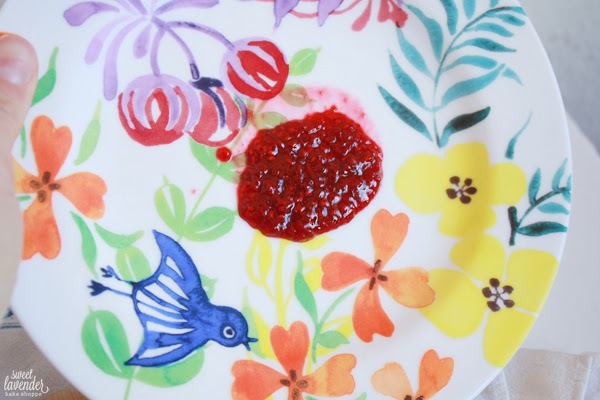 **If you are doing the plate test, at about 30 minutes in, test your jam. Remove plate from freezer, dollop a few tablespoons of jam into center and allow to sit 5 minutes. Then tilt plate upright. If it slowly drips down your plate or not at all, you're there! If it quickly slides down, cook longer. **As moisture starts to cook off, you will need to lower your flame in order to keep a gentle simmer AND will need to stir more frequently, to protect bottom from burning. At about 23 minutes into cooking, my heat was as low as it could possibly go and I was stirring every few minutes. 4. While the jam is cooking, wash and dry your jars and lids. Set aside. Sterilize your jam jars according to proper canning instructions, if you are going to store at room temperature for long periods of time. For this recipe, I simply washed and dried for storage in fridge for up to 3 weeks. My dollop of jam quickly slid down, so I continued to cook another 5-7 minutes over very low heat. 5. Once jam is done, turn heat off and purée. The easiest way for me is using a stick blender. 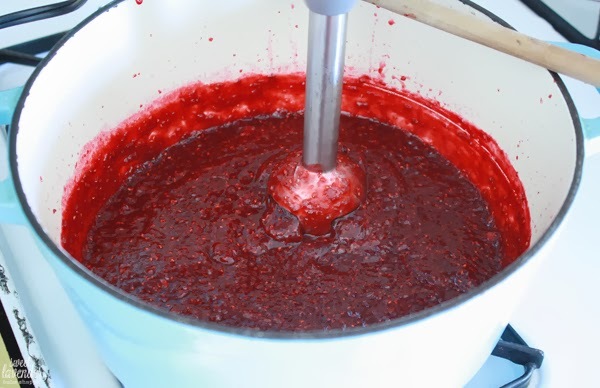 If you do not have one, carefully pour jam into a blender or food processor and purée away. 6. At this point you can strain any seeds out by pressing jam through a fine mesh strainer. We don't mind seeds at all and I hate washing more dishes than I have to, so we left the seeds as is. 7. 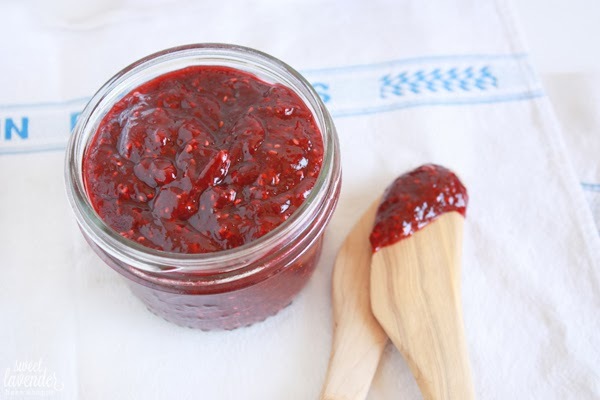 Quickly pour or spoon hot jam into your clean jars and tighten lids tight. I always use 2-piece self sealing lids for this. Allow jam to sit at room temperature until lid pops and are sealed. Finish with proper long term storage sterilization/sealing, if desired. Then, store in pantry if sterilized or in fridge if not. Will store in fridge for up to 3 weeks and in pantry for months. 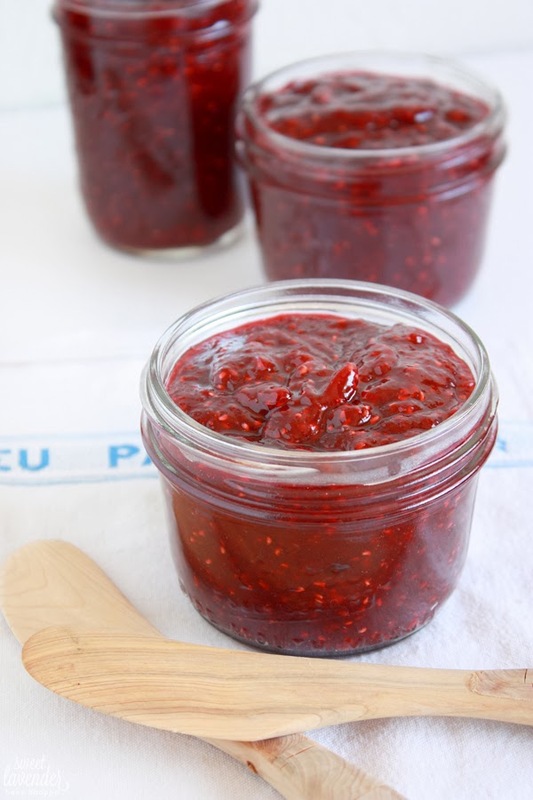 This bright, slightly sweet and tart jam is a perfect taste of the spring and summer months! Would be an amazing gift idea packaged with these homemade vanilla shortbread cookies or sugar cookies and a little offset spatula. Make this for your family at home, or gift up to friends and family around the globe...just make sure if you do the latter, you save yourself at least one jar. Amazing, I never thought about using brown sugar in jams, it must be delicious! you're amazing. every time. always.